Two former military airfields are being repurposed to compete for budget airlines looking to expand into Russia. Moscow may get a new airport by 2017 that will specifically cater to low-cost carriers. The project, which is estimated to cost 12 billion rubles ($340 million), calls for turning the military airfield of Yermolino into a civilian airport that would charge airlines 30 percent less than the standard handling rates, which could help carriers lower their ticket prices. However, first the airlines have to convince travelers to make the journey to Yermolino, which is located 45 miles south of Moscow in the Kaluga Region. Within the next four weeks, after the project's financing has been approved, a tender will be announced to select investors. The Defense Ministry is prepared to allocate 6 billion rubles to the modification of the airfield and the airport will remain the property of the Kaluga Region under a concessional agreement, according to Salavat Kutushev, C.E.O. of the Yermolino International Airport managing company. Talks have already been held with several potential customers, including easyJet and Ryanair. "They are interested, particularly because Yermolino will be in a position to offer 25 percent lower handling rates than the existing Moscow airports,” Kutushev said. The Yermolino project is expected to break even by 2022 or 2023. More than half its revenues should come from restaurants and retail outlets. Said Kutushev: "We will attempt to apply the European model. Landside sales [commercial turnover] normally account for around 20 percent of Russian airports' total revenues, while in Europe they reach 60 percent." Russian carrier UTair Aviation is already planning to base at least 20 to 30 Airbus A321 and Boeing 737 narrowbody airliners at Yermolino, which is expected to have a capacity of 7.5 million passengers in 2017. The Yermolino project is attracting attention at the same time another initiative is underway to transfer the Ramenskoye military airfield into a commercial airport. The primary investor in Ramenskoye, Avia Solutions Group, does not view Yermolino as competition. Said Thomas Vaisvila, the company’s deputy C.E.O. 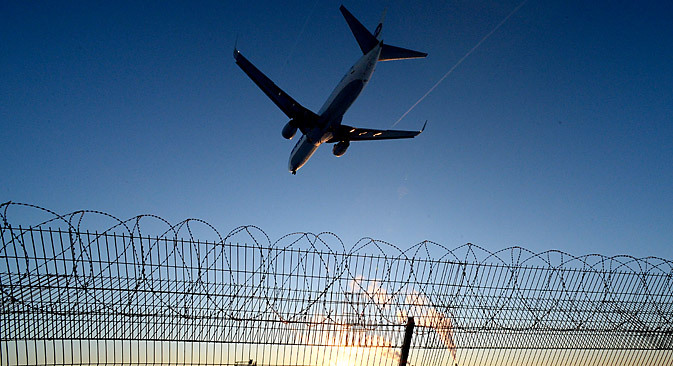 for infrastructure, these two airports have different potential. Vaisvila noted that in many ways, Ramenskoye has the edge over Yermolino. Ramenskoye has two runways, 1.86 miles and 3.3 miles long, which would allow Ramenskoye to handle as many as 10 million passengers a year. Yermolino for its part has just one 1.86-mile strip. Additionally, assuming a high-speed rail link is built from Moscow to each airport, Ramenskoye would b 40 minutes from the city by train, compared to 90 minutes to Yermolino. Independent industry expert Andrei Kramarenko is optimistic about the possibility of new airports serving the Russian capital. "Russia does not have a single budget airline, so the very existence of two low-fare airport projects is amazing," Kramarenko said. Based on materisls from RBC Daily and Kommersant.